Oi! Tim! What’s the best photo you’ve ever taken? I don’t much enjoy trying to answer that question (especially when it’s asked like that), but since it’s a question I get asked, well sometimes at least, I thought it might be an idea to do an article on it. Probably the simplest answer is that I tend to like whichever was the best photo from my most recent assignment at the time of asking. I do tend to prefer more recent work, perhaps because with every brief, with each new location, there are challenges to be met and overcome and I still love to learn something new from each shoot. 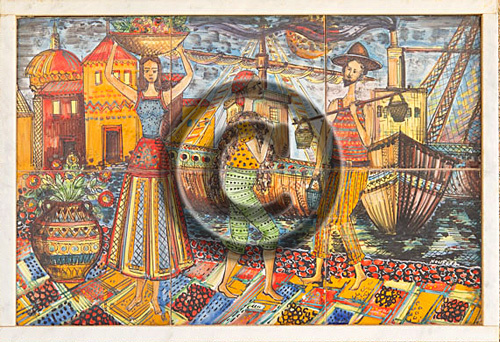 And maybe it’s that having a press background, I tend to see older work as having passed its sell-by date. Capturing a historical moment has a certain buzz. When I look at my recent commercial photography, I’m often drawn to the simple, relaxed corporate portraits, especially where I’ve captured something of the subject’s character, but I also have a fondness for the beekeeper portrait, which was not only tricky to light, but was tricky to shoot since I was in full protective gear and surrounded by bees at the time. 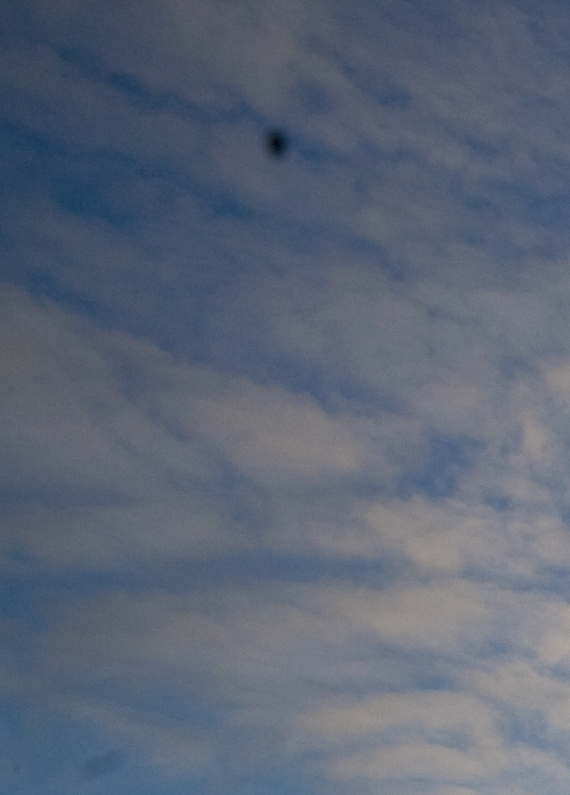 The beekeeper was a decent chap too, and gave me some honey after the shoot. Of course, what’s important is how the photo looks, not what was involved in getting it to look that way, but each picture has an emotional attachment for the photographer, which is why we’re often the worst judges of our own work. Looking at my gallery of public relations photography, I’d single out the portrait of the barbary lion, partly because he’s so handsome and also because everyone who sees that photo reacts with a “wow” or similar, which is always encouraging. Apart from the lion, I’m quite fond of the PR photo which I took for the Organic Milk Suppliers Cooperative. The idea of making it look as though the fridges in the middle of a field might actually be working tickles me, and adds an extra dimension of interest to the shot. 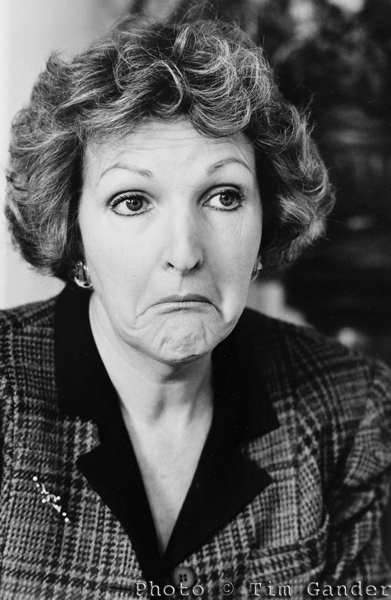 Actress Penelope Keith in mid-interview. Never published, but still a favourite. There are many photos and assignments I’d rank as favourites, but going back beyond the last 12 years leads me to that period when I was a staff photographer, so don’t have the copyright in those shots, which means I can’t publish them here. There’s the shoot I did in Norway with the Royal Marine Reservists, which included a striking shot of a marine bursting up through freezing lake water during a survival exercise, his shocked expression and the water droplets cascading from his hair making it almost uncomfortable to view the photo. Or the single frame I managed to get of HM The Queen arriving at Portsmouth Harbour train station on a drizzly night, simple headscarfe and clearly not expecting a photographer, though smiling all the same. Whether you’re a professional or amateur, do you have a favourite of your own? Or perhaps there’s a photographer you admire, or a particular photo that sticks in your mind. Feel free to share your thoughts in the Comments section below. How Pro is your Profile? According to 90% of statistics, 75% of all life forms on Earth are either on Twitter, Facebook, Linked In or all three, while the remaining 25% haven’t developed opposable thumbs and don’t have broadband yet. Ok I just made all that up, but statistically speaking I’m probably right, and anyway it’s fair to say that if you’re reading this article, you’re also (and probably simultaneously) chatting on Facebook, tweeting and maybe updating your Linked In account, or somesuch useful activity. What you might also be doing is uploading another comical profile photo to one or all of these accounts, but if you’re using any of them as a way of presenting your “professional” self, should you really be uploading that photo of your bottom with the comedy mustache and glasses? Do your clients really want to see you, lobster-like from the beach, wearing a jaunty party hat, a bottle of wikkid, or whatever in your hand? Even if your photo is more sober, do you look like one of Interpol’s most wanted; or as if you work in a stationery cupboard, surrounded by files, papers, shelves and broken fax machines? The model wasn’t much cop, but at least he’s recognisable. Your profile photo might be just a couple of hundred pixels, but that’s even more reason to make the most of each and every one of those babies. It’ll be the first thing anyone looks at when they see your profile, or any comment you make on a social or business site. So make it work for you; make sure it’s clear and makes a decent impression. That isn’t to say it can’t be humorous, but remember that your sense of humour isn’t everyone’s cup of tea. My photo is straight and simple, but at least I’m recognisable from it. So often, that valuable little space on the web page is wasted with a photo that is too detailed to make sense, and the subject of the photo is so small in the frame that their own family couldn’t recognise them. But whether you’re beautiful or have a face like mine, what people want to see is you. They want to know what the person behind the Facebook account or Twitter conversation looks like because normal people engage and do business with other normal people. Hiding behind an obscure photo, pattern or, perhaps worst of all, a blank space can make your comments on blogs and in discussions look like spam. People want to know you really exist, that you’re not hiding behind a phishing scam. It’s one more opportunity to make an impression and (oh how I hate marketing speak) “build your brand” *gag*. So do yourself a favour. Get a decent photo, get a friend to take it. 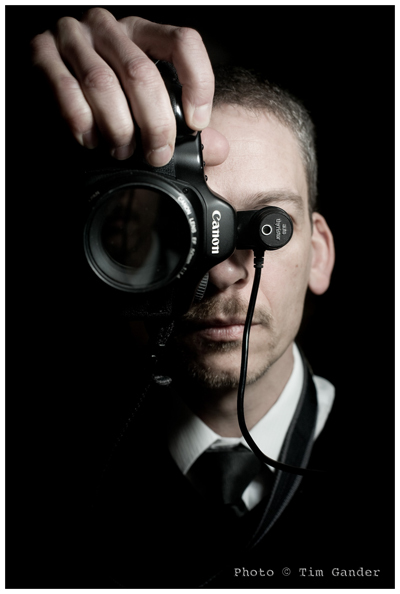 If you’ve hired a photographer to take pictures for your business anyway, ask them to shoot you a profile photo with decent lighting. Then stick with that picture for as long as possible, because it will be what people come to recognise you by on all the forums and sites you engage with. Keep changing it, and people will lose track of who you are. Now go, get it done and don’t let me catch you looking like a drunken party closet terrorist again. Your leader is speaking; please be seated. Hello my lovely, loyal readers. And that is all. Move along now, there’s nothing else to see here. Electile Dysfunction Problems – what’s next? We may have just had the most exciting election since Blair took power from the Tories in 1997, but the result has been somewhat surreal and indecisive. At least now David Dimbleby can finally take a nap and Gordon Brown can finally switch his smile off for good. No more face-strain for Gordon, no more wincing for us. I suppose we have to accept that the most pressing job of the new government will be to sort out the dog’s breakfast we laughingly call our economy, though to be fair to Gordon and Labour, it really wasn’t their fault. The problem is, as it’s not the Government’s fault, by logical extension there also isn’t a great deal any government can do to correct it apart from push some debt around until it pops up somewhere else, like a fiscal version of whack-a-mole. I don’t wish to dwell too much on the economy though. I’m happy to leave it to others with far larger brains than mine to make an even bigger mess of it at the expense of those of us least able to cope with the consequences. What I’m really interested in for the purpose of this blog is what a Tory/Lib Dem government will do about copyright, orphan works and extended collective licensing. Will all photos on the net have to be disfigured just to protect them? Yes, I know it’s not a major issue right this minute, but it will become one very quickly and we can’t be sure when it will sit up and slap us in the face, so we need to be prepared. 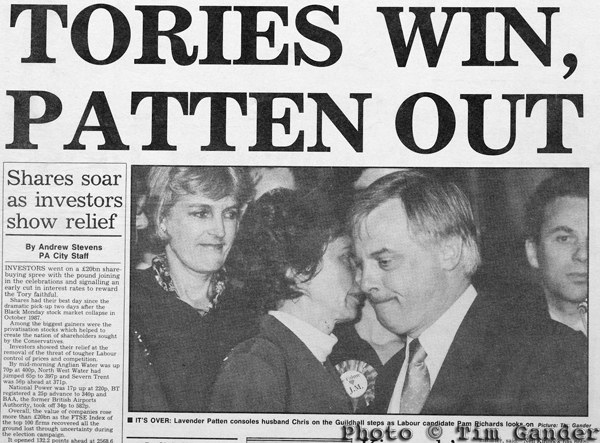 Let’s look back first to those halcyon days when a Parliament wasn’t hung and prime ministers weren’t a double act. When the Digital Economy Bill was passed into law (the DEB almost certainly will be revisited soon) and the orphan works clause was debated, albeit briefly, in the Commons. What happened then, just to recap, was that under lobbying pressure from photographers and the Stop43 campaign, Conservatives (with an eye on the electoral prize) agreed to drop Clause 43, while Labour (perhaps thinking they had more chance of a majority than they actually did) decided they didn’t need to drop Clause 43 – or perhaps it was their bargaining chip for getting the rest of the DEB through all along, whatever. Meanwhile, Don Foster for the Lib Dems argued to amend the clause, but keep it. This despite the fact he’d been told in great detail why this was a bad idea. So now that we have a Tory/Lib Dem coalition government, do we really know where the parties stand? The Conservatives said at the time of the DEB debate that there would need to be a proper review of copyright, OW and ECL after the election, and it would appear that at face value they have some sympathy with photographers and other creators of original content. But then we have the Lib Dems, who clearly don’t understand the issues. With some luck the Lib Dems will see the light, and the Tories won’t be lobbied so mercilessly by publishers, aggregators and content thieves that they lose sight of the fact that photographers generate a great deal of wealth for business and the country. It’s part of our industry and our culture. It’s our heritage too. 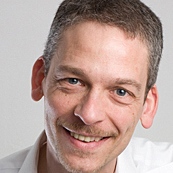 Without professional photographers, all users of images would suffer and visual innovation would stall. It’s going to require a mammoth effort from core groups of photographers to draw up required minimum standards for any review and subsequent legislation, but it will also require the effort of individuals who claim to care about photography. They will need to keep in close contact with local groups, who in turn should keep an eye on developments at national level so that when the time comes, our voices won’t be drowned out by big business and freetards. A slight departure from my normal blog, but it’s been a bit of a special occasion in Frome today. 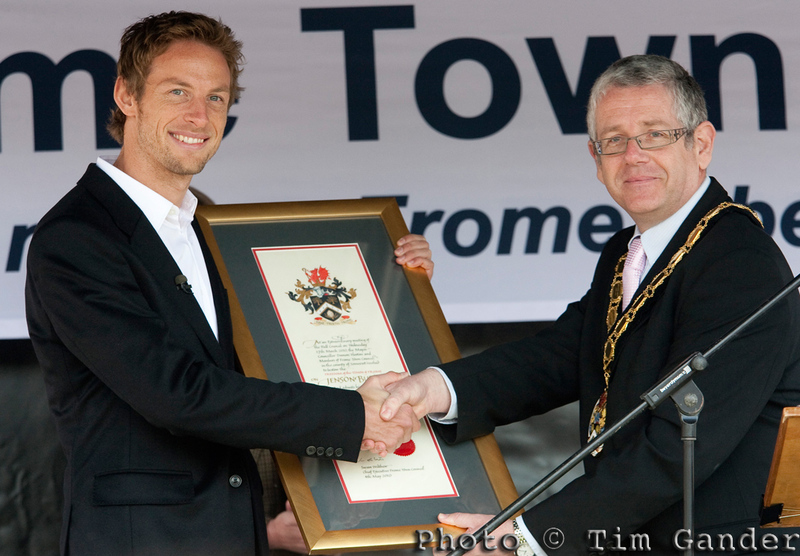 On a beautiful sunny Spring day, in the Frome Market car park (dolled up for the occasion) Jenson Button, Formula One World Drivers’ Champion, was granted the Freedom of Frome Town. By my guesstimate there must have been around 3,000 people there to greet him as he took to the stage to be presented the award by the town Mayor, Councillor Damon Hooton. Children craned to get a glimpse, women shouted their love, and men cheered his every word. The whole shebang was over in just under an hour, during which Jenson was introduced, the Mayor did a recap of Jenson’s life in Frome and presented the award, after which Jenson answered questions previously submitted by members of the public. 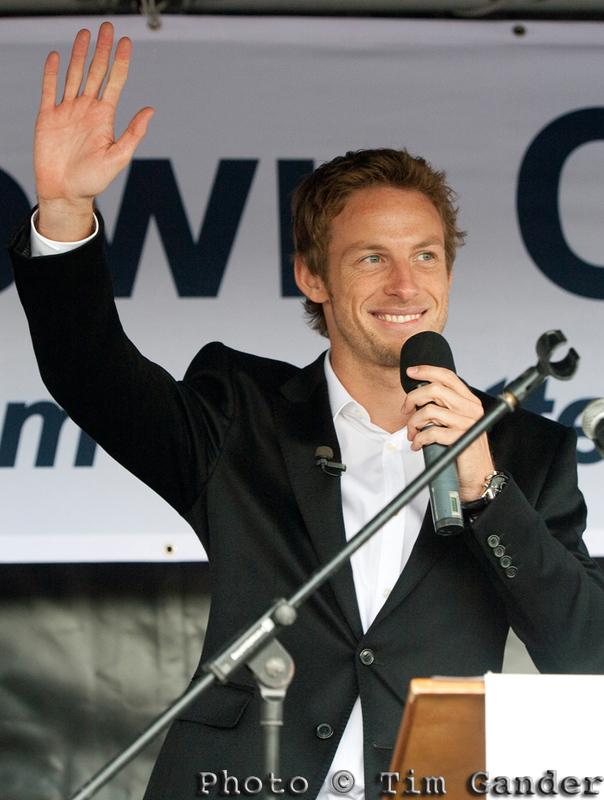 He was very PC, denying ever having raced the roads around Frome as a youngster, but charming, humble and down-to-earth. 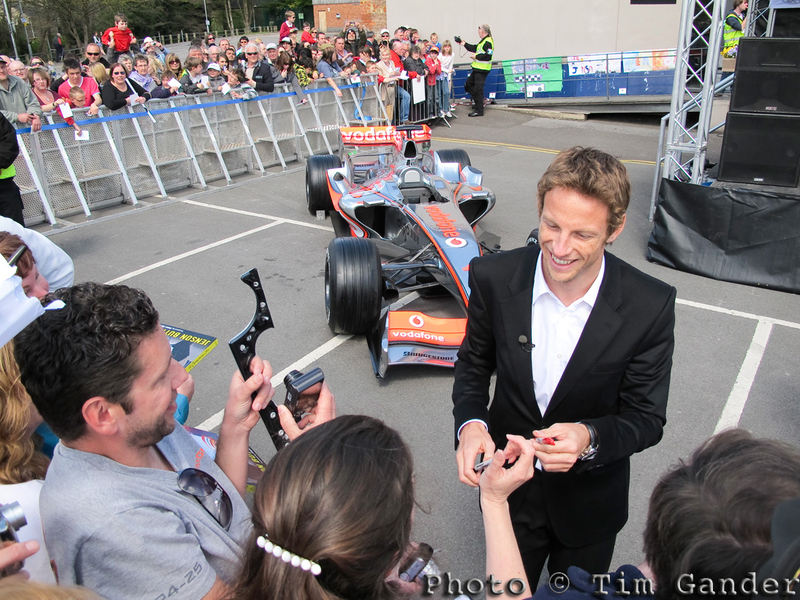 Once the main duties were completed, Jenson set about meeting his fans, posing for photos, signing autographs on everything from post cards to books to bits of car. All the while smiling, and clearly enjoying the whole event. Enough of my blather, here are some photos from today. Jenson receives the Freedom of Frome Town from the Mayor, Cllr Hooton. 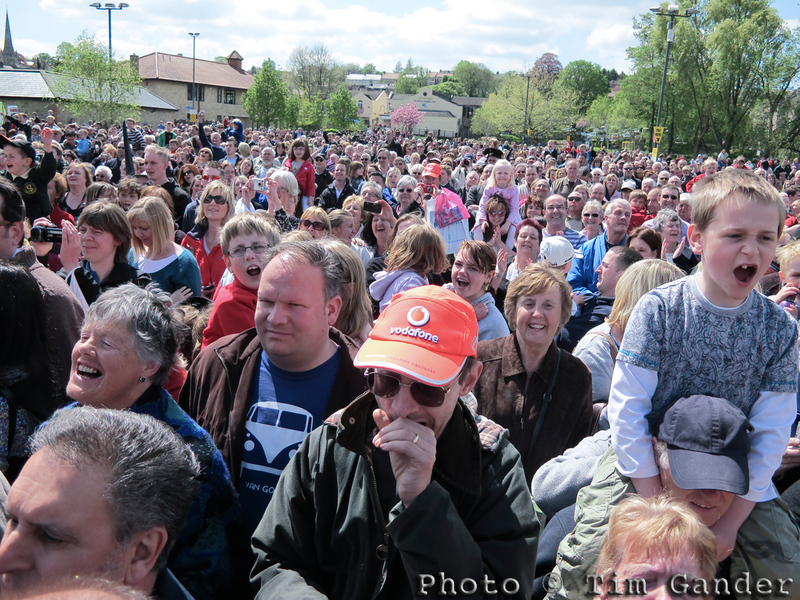 Fans of Jenson pack the car park. 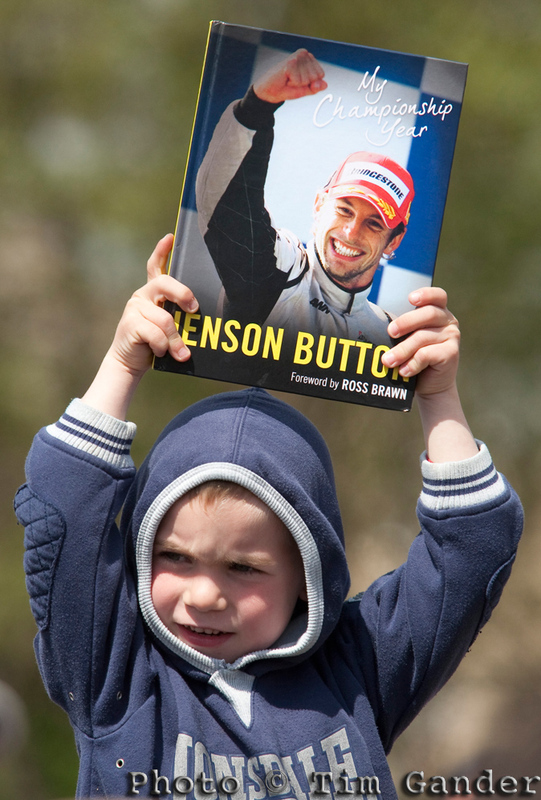 Jenson signs cards, books and bits of cars. If you’ve tuned in for a bit of a photography perspective, I shot these photos on a Canon 5D with 1.4x converter on a 70-200 f2.8 lens (pre-IS model), apart from the crowd and signing photo which was shot on my new Canon G11, which I’m testing out prior to using it for a bona-fide shoot.